With its generous culture, fascinating history and delicious gastronomy, Italy will seduce romantics and curious minds. Without further ado, come and live fully the 'Dolce Vita' by settling in one of our sumptuous villas in Italy. Elegant villa on the Amalfi Coast with private pool and stunning views of the sea for 12 people. To meet your needs and expectations, our specialists will follow you in the organisation of your stay. Airport transfers, house staff, spa… also, know that our multiple customised services are available to guarantee you holidays in complete serenity! 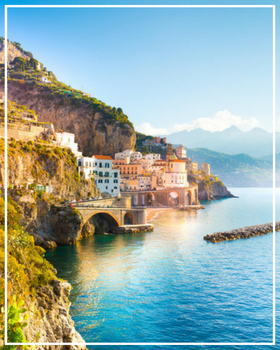 Italy is an ideal destination to get away from it all, without going too far. In the heart of Europe, a stay in this beautiful historic country, with cultures and colourful traditions, promises unforgettable moments with family or friends. The fine gourmets will be delighted to taste the authentic Italian gastronomy. Indeed, the culture of this beautiful country is also discovered through its cuisine, renowned throughout the world and listed as intangible cultural heritage of humanity by UNESCO. During your vacation in an incredible luxury property, take time to enjoy a family breakfast, to taste typical dishes in the many authentic restaurants. Take advantage of your holidays to take a walk in the markets to touch the flagship products of Italian gastronomy: charcuterie, wines, olive oil and many other fresh products that will charm you. If you are going to Sicily, do not hesitate to taste some specialties such as the sweet wine, the Malvasia de Lipari or the Passito de Pantelleria. Spending a holiday in Italy is the promise of enjoying holidays under the symbol of culture. This militant country has a rich and tumultuous history which it is important to know and understand. Choosing to stay in a prestigious house means choosing to enjoy incredible comfort while enjoying the richness of Italian culture. The Southern regions of the country are full of places to see and visit. It is impossible not to make a detour through the charming region of Campania or to visit the many archaeological sites loaded with history and legends! The North of the country is rich and marked by its industrial past where you will find large cities such as Turin, Milan and Venice, and natural spaces that are still wild. The centre of Italy radiates thanks to the sublime cities and regions that it houses: Florence, Tuscany, Umbria...places that are unavoidable and surely seduce the visitors who go there. Choosing a beautiful luxury villa in Italy during your holidays also means being in the heart of sublime natural areas. Although the country is known around the world for its buzzing metropolis, the famous boot has many natural sites that are still wild. Villanovo offer you the unique experience of lodging very close to some of the most beautiful natural spaces like the sublime lakes. With its very attractive climate throughout the year, you can always enjoy an outdoor stroll for green tourism enthusiasts.